We need to stop the slaughter of our rhinos. Rhinos are being poached for their horns, which are more valuable than gold in Southeast and Far East Asia. Vietnam in particular shows a high demand for rhino horn, as where it is often used as a part of traditional medicine. Various conservationists are exploring different proposals to stop this senseless slaughter of innocent animals and save the rhino. Here are the top three most promising solutions that experts have devised. The proposal is that without a horn, rhinos are useless to poachers. However, the situation is a bit more complicated. Rhinos need their horns in order to protect their young, defend their territories, and to forage for food. There have been previous successes with regard to dehorning, but there have also been failures. Between 1989 and the early 1990s, Namibia tried dehorning in conjunction with improving their security and funding anti-poaching efforts. This led to a notable decrease in deaths of rhinos, and rhino conservationists perceived it as a great success. During the early 1990s in Zimbabwe, however, poachers killed most of the dehorned rhinos in the Hwange National Park within a year and a half after being dehorned. This is because dehorning a rhino leaves a small part of the horn behind. Removing this part would be painful and dangerous. Due to the high value attributed to rhino horn, poachers are still willing to kill rhinos for a stub. While dehorning rhinos is a strong possibility, rhino conservationists should use it in conjunction with other methods to ensure that it is successful if we want to save the rhino. Let’s begin by saying that the poison is not harmful to rhinos. It is only harmful to people who ingest it. The dye, similar to dyes that stain banknotes, makes rhino horn poisonous to any who eat it, and airport x-rays can pick it up, even if the horn is powder. This method might render rhino horn useless on the black market. Rhino conservationists hope that this method will cause rhino horn to lose its commercial value, because it is unsafe for ingestion. There is no evidence, as yet, that a rhino’s body might absorb the poison. 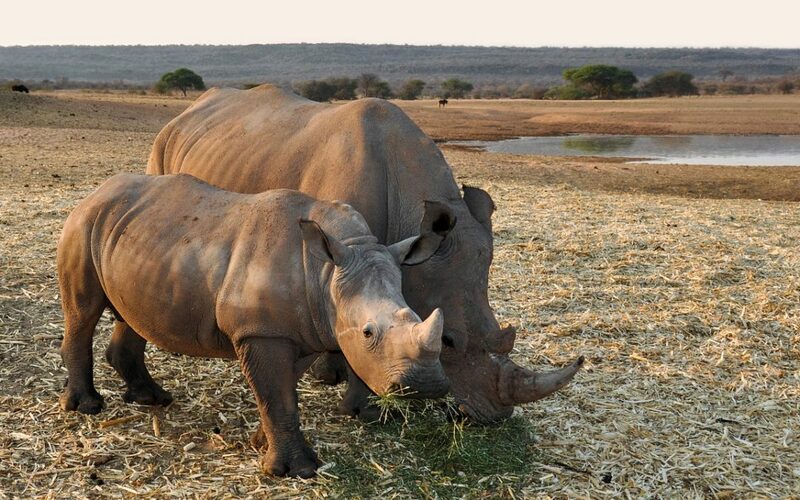 Many people are still under the impression that rhino horn has medicinal properties. There are, however, no credible medical studies to suggest this. Rhino horn does not make you look younger, make you more fertile, free you from demons, or cure typhoid or the flu. One can find many of the supposed medicinal properties of rhino horn in many plants and herbs. Anti-poaching and informative campaigns are the recommended direction to head in. None of these solutions are adequate on their own. What rhino conservation needs is a full campaign that incorporates certain aspects of each possible solution. This campaign will show people that rhino poaching is harmful to the animal, and is a useless endeavour for the final party. We need to protect our rhinos. You can help by donating to the Player Ntombela Foundation. You can find out more solutions to rhino poaching here.